With Energy Design Update, you can stay abreast of the latest progress in creating homes that save energy while optimizing economy, comfort, and health. The newsletter presents unbiased news and advice about developments in technology and regulation, objective product reviews, design and building tips, practical research reports, and tutorials. 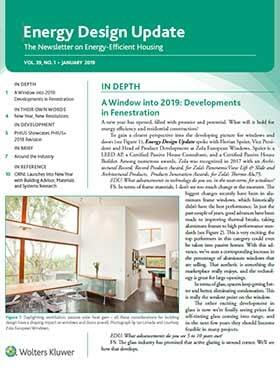 When utility executives develop load management programs, evaluate new technologies, or train residential account reps and supervisors ... when architects look for help in designing cost-effective, energy-efficient homes ... and when manufacturers of windows, insulation, and furnaces want to monitor the competition ... they turn to Energy Design Update. Practical solutions to problems - Discusses easy ways to know the R-value of an entry door. The best handbooks on moisture control. Why you don't need polyethylene vapor retarders. Why floor trusses can lead to frozen pipes. Follow up on important stories - The articles come with detailed contact information -- names, addresses, phone and fax numbers -- so the reader can track down additional details they may need. Additional compliance tools, including help with permits, handling emission source monitoring data, and detailed references to hundreds of sources of air quality information, including Internet sites.